The Samsung Galaxy S4 zoom packs a 4.3" Super AMOLED screen picked up from the S4 mini parts bin. It has qHD resolution (540 x 960) and 256ppi. That's not enough to challenge higher-end devices like the Galaxy S4 or the Galaxy Camera, but reasonable in the midrange. Super AMOLED renders highly saturated colors (if you're a fan of that) and has great colors and viewing angles. It isn't particularly bright though and not as reflection-free as some other Samsung AMOLED screens so sunlight legibility suffers. There are cases when the S4 zoom display is hard to see in direct sunlight, which is a problem for a camera. The display doesn't use a PenTile matrix, instead it uses the arrangement that debuted with the Galaxy Note II with three subpixels for each pixel, but the Blue one has a different shape. Anyway, the sharpness isn't on the level of 400+ ppi flagships and you can notice occasional jaggies and color halos around fine, high-contrast detail like text, but you won't see it in photos. While 4.3" of diagonal and qHD resolution are in the midrange as far as smartphones are concerned, the display is actually pretty high-end for a point-and-shoot camera. Most cameras you'll find have 3-or-so inch screens (even the touchscreen models) and far lower resolution. The front of the Galaxy S4 zoom is a direct copy of the S4 mini - there are the front-facing camera, proximity and ambient light sensors around the earpiece and the hardware Home and capacitive Back and Menu keys below the screen. One thing we liked (even if it took a little getting used to) is that the camera app disables the capacitive buttons. Those are too easy to press accidentally when you hold the zoom in one hand. The right side of the phone (top if you look at it as a camera) holds the Power/Lock key, volume rocker and the shutter key. The Power/Lock key and volume rocker are fairly thin and not the most comfortable to use. The hardware shutter key is another matter though, it's fairly comfortable even though it would have been slightly better to use if it was slightly further to the left. It can be half-pressed to focus and will launch the camera app if you hold it (but it doesn't automatically unlock the phone). On the Galaxy Camera there was a zoom lever around the shutter key, but is missing here. Instead, you can use the control ring around the lens to zoom in and out (or use the volume rocker as on a regular phone). The ring has a ridged exterior for extra grip, but rotates smoothly (there are no distinct steps). At the moment, the ring only controls the zoom, but we hope Samsung adds an option to control things like aperture, shutter speed and so on. Anyway, the ring has an advantage over the zoom lever, it's much easier to get a specific zoom level. Next to the lens is the xenon flash and LED light. 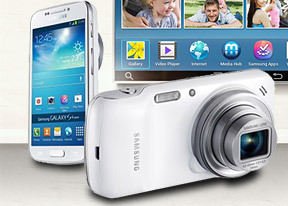 The flash is always available, you don't have to manually extend and retract it like on the Galaxy Camera. On the other side of the lens is the loudspeaker grille. The top side of the Samsung Galaxy S4 zoom (left in camera orientation) holds the 3.5mm audio jack, secondary microphone and the IR blaster. On the bottom (right) is the primary mic and the MHL-enabled microUSB port. The USB port is actually at the edge of a plastic flap that covers the battery and microSIM card slot. The battery compartment was borrowed from digital cameras and features a lock that holds the battery in place. The battery has 2,330mAh capacity, a bit more than the Galaxy S4 mini got and not bad for a point-and shoot camera. Keep in mind that most such cameras don't have active radios, which can drain the battery pretty quick. The microSIM card slot can easily be accessed without having to remove the battery, which is great if you need to swap out the card (the Galaxy S4 zoom will probably not be your primary device and you won't keep a SIM in it at all times). The microUSB port handles charging, data connectivity and TV Out duties and can be used with the flap open or closed. Moving on, the left side of the phone (bottom for the camera) offers a microSD card slot, tripod mounting hole and the lanyard eyelet. The microSD card slot is covered by a plastic flap and the card is easily hot-swappable. You'll probably need a card in there as the S4 zoom comes with only 4GB of built-in storage and there's less than 3GB available to the user. Along with the Samsung Galaxy S4 zoom, we also received a case for the device. It consists of a rubbery strip that encircles the phone and has buttons for all the controls. It keeps the microUSB port exposed, so you can charge the zoom and download photos without having to remove the case. The case probably won't protect the device against drops, but at least the screen will be safer under the flap. The flap has a groove about a third of the way from the side so you can flip it slightly open to take a peak and close it. It's an active cover too, so the screen wakes automatically when you do that. There's a hole for the earpiece so you can talk with the flap closed, but there's no window that shows a part of the screen with the time and notifications.